Short and sweet; no spoilers; only broad opinions; you know the drill. Ten years. Nineteen movies. Good lord. Even in this age of media-saturation, the combination of consistent quality and sheer volume that Marvel have achieved with their Cinematic Universe is otherwise unheard of. Even the weaker entries are better than most of their rivals can produce. But have the comic connoisseurs set a bar that only they can reach, or made a vibranium rod for their own backs? 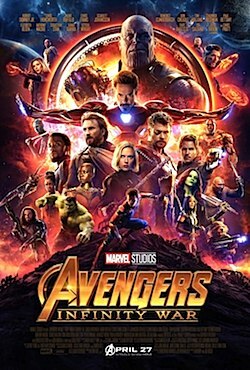 Following directly on from Thor: Ragnarok and Black Panther, Avengers: Infinity War is the culmination of a decade's worth of interconnected storytelling - and the third 'crossover' entry whereby the heroes and villains get together for an almighty two-hour-plus fight scene. This is also the third saga-entry directed by the Russo brothers, Joe and Anthony, after helming Captain America's second and third outings (the latter of which was basically an Avengers movie anyway, to be fair). So, things come to a head when Thanos finally makes a play to collect all six infinity stones - the reality-bending gems which have been our MacGuffins throughout the story so far. Crossing the galaxy and causing various factions of our favourite heroes to cross paths in the process, alliances are forged, bonds are tested and lines are crossed. This is the supergroup to end all supergroups. Now it's no spoiler to say that with a run-time of 'only' two and a half hours, there's a lot of plate spinning going on, here. By necessity, Infinity War is a series of separated vignettes, pulling towards a connected conclusion (although again, that's what the whole series has been). The Russos hold things together well and keep everything focused, but the story is - and I mean this in the nicest possible way - absolute mayhem. Other than bursts of reminder-exposition in the first act, there's little in the way of spoon-feeding, and the film relies on its audience being up to speed with the state of the MCU. Every frame of every scene matters, nothing is wasted, and Christopher Markus and Stephen McFeely's screenplay deftly combines action, humour and genuine emotion, all soundtracked by Alan Silvestri's majestic score. The writers' decision to spread events across the cosmos is a wise (and fitting) one, and means that even at its most chaotic, the viewer never loses sight of who's in a scene and why. 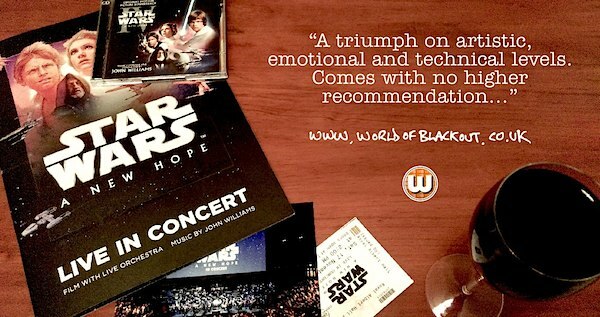 Little that happens here will necessarily cast a new light on the old movies, but characteristics and relationships we've previously seen are built upon, not just wheeled out for the sake of audience recognition. 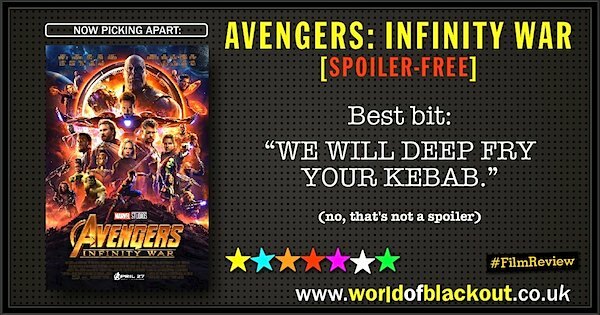 Best bit: "WE WILL DEEP FRY YOUR KEBAB." Is there a Wilhelm Scream? If there is, it's not obvious. Is there a Stan Lee cameo? There is a one, yes. Is there a mid-credits scene? There isn't a one, no. Is there a post-credits scene? Yes, there is. Stay for this. The previous eighteen Avengers-timeline movies, to be fair. There's perhaps not enough screen-time for any individual to pull a 'best of' badge, but it's all top-drawer stuff. Well, that rather depends on you, doesn't it? I didn't notice one, but if you did then let me know. Level 1: Dryden Vos is in this. This wasn't made for me. I say that about an increasing number of films of course, but probably best to get it out of the way now. I knew this wasn't made for me long before I sat down in screen 1 of course. But when I found myself the youngest person in the auditorium, watching the flag-waving trailer for Dambusters 75 and Diane Keaton sliding towards being offered gigs doing life-insurance adverts, it was a done deal. So imagine my utter delight*1 at the first scene of Mike Newell's The Guernsey Literary And Potato Peel Pie Society, beginning on the island during occupation in the Second World War, where the drunk Tom Courtenay character vomits onto the boots of a German officer while my surrounding audience chortled heartily. The film's very first gag (no pun intended) bears all the hallmarks of Brexit: The Movie, a simplified, rose-tinted, fictionalised*2 version of history that few involved are old enough to remember at all*3. And so it plays for the entirety of the first act and well into the second. After this opening we jump to 1946, in the immediate aftermath of the war. 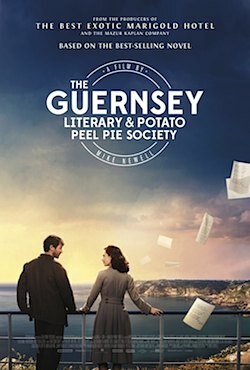 Lily James plays Juliet Ashton, a london-based writer travelling to a fishing village on Guernsey after hearing about a secretive book-club used to keep up morale during the occupation. Once there, she finds that not all of the inhabitants are ready to be open about those years, and that the cobbled streets hold darker secrets. Meanwhile, Juliet begins to fall for the man who initially wrote to her about the Society, after finding her name in a book she once owned. Everything's slightly sepia-tinted and there's a piano and light-orchestral score. You get the picture. Credit where it's due, Lily James leads the ensemble cast well, gives the clunky script her absolute best and is always a pleasure to watch (even if she's essentially reprising her role from Darkest Hour). However, Lily's frequently required to walk around muttering to herself and to read everything aloud, so certain is the director that the audience needs to be spoon-fed whatever remains of any subtext. Meanwhile, Katherine Parkinson seems to have been given the script from another film. Again, she's always fun to be around but her boozy, spiritualist character becomes more disparate from the setting as the run-time increases. Penelope Wilton is turned up to 10 for the duration, her wild-eyed mistrust of anyone from the mainland sure to be a hit with island communities everywhere, and Matthew Goode appears to be playing a role which has been written specifically for Jeremy Irons. Despite the wardrobe department and set-dresser's best efforts, none of what we see feels like it's happening in 1946, but in a modern-day facsimile. The shadow of this artifice is always in-shot, with the performances spirited but ultimately a bit pantomime. There is a decent story buried beneath the layers of smugness and sanitised post-war defiance and denial, though. The strand about Jessica Brown Findlay's Elizabeth, her affair with an occupying soldier and the child they had deserves its own movie, quite honestly, suggesting that if this one took itself a bit more seriously it would have much more to offer. The main problem (ie not just me saying "I didn't enjoy this") is that the screenplay is never quite sure which plate it should be spinning. You can have the story about how books can bring people together and inspire during dark times, you can have the story about the islander who fell in love with an enemy soldier and how their relationship was doomed from the start, or you can have the story about the wide-eyed outsider who goes off to a close-knit community and falls in love with the pig farmer*4. But choose one. The gear-change between each strand is jarring as it effectively becomes a different film each time. Despite moments of demonstrable heart, this is nowhere near the movie it could be. 30% charming, 70% infuriating. 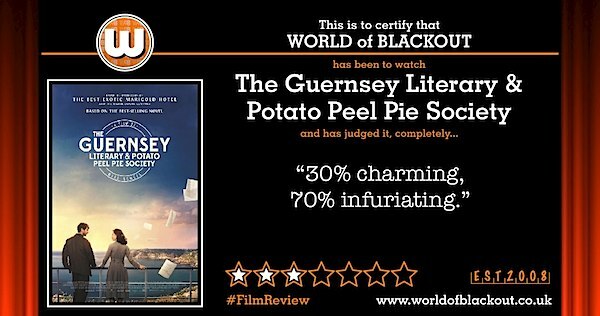 I never thought I'd write these words, but in the hands of Richard Curtis, The Guernsey Literary And Potato Peel Pie Society could have been quite wonderful. But it wasn't, and it isn't. Behind the closing credits we get an audio-track of the cast reading passages from famous novels, an attempt to remind the audience that the story was about books and convince them that they've watched something well-written. Best bit: The start of the movie where the fledgling book-club all bond together by getting pissed on homemade gin and killing a pig. This is Their Finest in a car crash with Suite Française. If you want a story about the power of the written word in a wartime environment, try The Book Thief. It'll be on the £3 shelf at Asda in no time at all. There's a chance of that, yes. Level 1: Republic Captain Maoi Madakor is in this. *3 Although unlike Brexit, this movie has the bonus of at least being an optional pursuit. 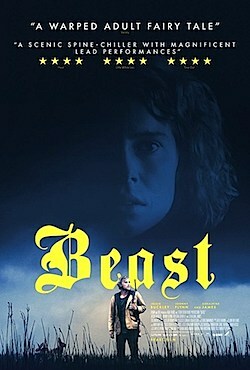 Writer/director's Michael Pearce's Beast is just that. Following Moll (Jessie Buckley), an introverted young woman living on the island with her domineering mother (Geraldine James) and a father in the early stages of Alzheimer's (Tim Woodward), we see her meeting and falling in love with a local handyman and poacher, Pascal (Johnny Flynn). A spate of abductions and murders of young girls has the islanders on-edge, and while nobody dares to point the finger directly at Pascal, he does have a chequered history. Moll, still struggling to come to terms with events in her own past, is torn between the guilt of a family life which is suffocating her, and freedom with a man she knows no-one will trust. 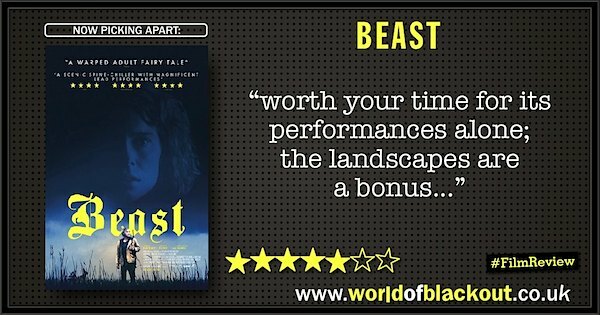 The first thing which hits you about Beast is that it's quite televisual, in a sort of Sunday night, 10pm sort of a way. But you also know that if it had premiered on television, you'd be wondering why it wasn't on at the cinema. The photography here is gorgeous, capturing the vibrant, bleak and poetic landscape in the same way as it does with its cast. From her very first scene, Jessie Buckley's Moll is both unstable and haunting, almost matched by Johnny Flynn in a role which brings to mind a younger, more suave, but still thoroughly unhinged Sean Harris. And while we're on the cast, Geraldine James is also every bit as terrifying as her part requires. Sympathetic characters are thin on the ground, here. Cinematographer Benjamin Kracun captures a weird, timeless quality on the island, assisted by Jim Williams lingering score. The interior settings often look to be of the late 1970s, but not in a pastiche, Life On Mars sort of way. This just looks like a community which has become left behind without any of the residents noticing. And while there's nothing specifically setting the events in any fixed timeline, the TV reports and news-crews (and the police's use of digital voice recorders) seem to place this in the 21st century, yet we don't see a single mobile phone for the duration. While the film drops certain clues and easter eggs with regards to the characters' pasts, Pearce doesn't spend too much time tying everything together. Ultimately, this is about shame, remorse, unresolved psychological issues and abusive relationships. It just happens to have a murder-case at the centre of it all. Calvary, La Isla Minima, Sightseers. I suspect this will get a fairly limited release, but if you can, sure. As enjoyable as it is, this will probably be a streamer. Not a huge amount of rewatch value unless you're in love with the Jersey landscape.. Difficult for me to say, but it's solid work all round. Level 1: Battle-of-Scarif Rebel pilot Blue Three is in this. 2. Oppressively heavy; sluggish; lacking spirit or animation. 3. 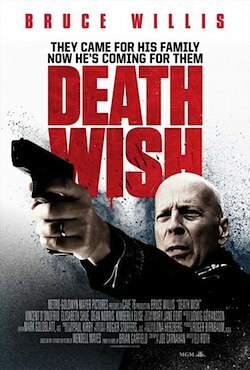 Joe Carnahan's screenplay for the objective-free 2018 remake of Death Wish. 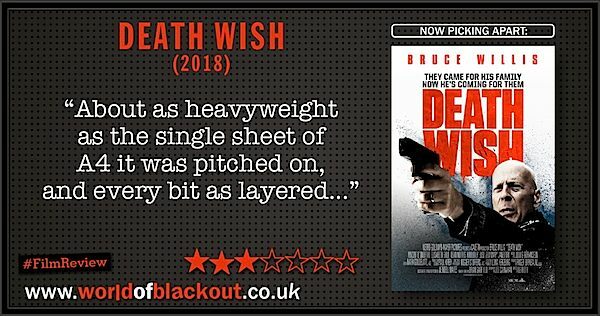 I imagine we're all vaguely familiar with the plot setup of Death Wish, but here it is anyway: hard working, blue-collar (well, an ER doctor) family man Bruce Willis*1 is out of the house one night when a burglary by some local thugs goes wrong. This leaves his wife dead and daughter hospitalised. Like anyone, Bruce's first reaction is to seek revenge on the escaped perpetrators, because the goddamned cops just can't seem to get the job done. Like anyone in a film, he manages to acquire firearms illegally*2 and begin his gruesome task. There's some shooting, some crying, some more shooting and eventually the same cops let him get away with it because he's a vigilante who is white*3. But y'know what? This is A Saturday Night Movie and I watched it on a Saturday night*4, so has anyone really been conned? The central plot-conceit of Willis hunting his family's attackers is at least more of a driving force in this telling*6, but the amount of actual detective work our doctor has to do is kept to a bare minimum, as there are apparently only about twelve criminals in Chicago, so everything falls into his lap in short order. If only the rest of the Death Wish was so efficient. When the cast aren't discussing exactly what's just happened in the previous scene or what they think is going to occur in the next, they verbalise their feelings and inner monologues, since apparently that's as good as them doing acting. Willis has the look of a man who does not want to be here, and every disinterested grimace brought to mind Kevin Smith's anecdotes about his time on Cop-Out. One suspects that director Eli Roth 'got the moon' on this particular set. Roth's not that interested in the sleuth work, and he's certainly not in this for the moral ambiguity. Nope, uncle Eli has rocked up for the grudge-match gunfire, but even this is bereft of the unbridled joy he's brought to such endeavours in the past. If this had been Tarantino and two decades earlier, the screenplay might have gotten away with seeming ironic. In 2018 it just feels dated, even (especially) with Memes™ shoehorned in as horrifically as Bastille Day's use of #Hashtags. When the finale eventually cruises into view, you know the director's been waiting for it every bit as much as he hopes the audience have. As so often in real life, the violence is short, messy and oddly anti-climactic. Maybe that's the real message of the film? While I'm thankful that Death Wish is nowhere near as grubby as Knock Knock, it's clear that Roth's not trying to make anything unique, here. And since the original film has a further 4 sequels (the last in 1994), you have to wonder what the point is, if there's no new angle being presented. Streaming / £3 DVD, max. Level 2: Bruce Willis was in Unbreakable with Sam 'Windu' Jackson. As the third-entry in a recent four movie marathon, Cory Finley's Thoroughbreds was something of a wildcard. The performance-time fitted neatly into my schedule, and I'd seen the trailer once several weeks previously, although I couldn't remember much about it. With this in mind, I felt somewhat unprepared as I sat down in screen 4*1, which is probably why I can't decide if Thoroughbreds is interestingly uneven or completely magnificent. Well. 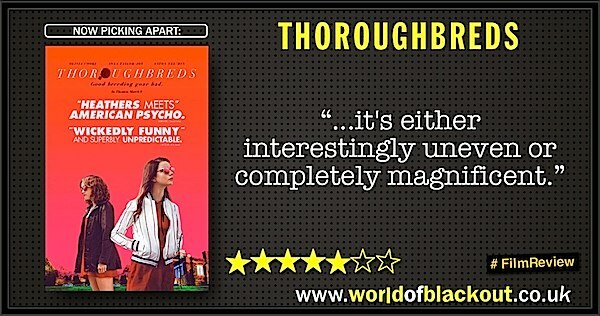 This felt like hiding in a broom-cupboard during someone else's group therapy session, and if that idea fills you with horror then Thoroughbreds won't be for you. 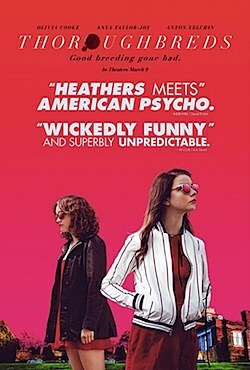 This is very much a performance-piece, bouncing between Olivia Cooke's oddly-detached Amanda and the concealed seething of Anya Taylor-Joy's Lily. Taylor-Joy is dependable as always, although it's great to see her again in a more dramatically-demanding part (cf). Anton Yelchin has a smaller role than the publicity-machine would perhaps suggest (his last, sadly), as low-rent potential assassin Tim, but his presence brings a more human sense of comic-uncertainty (and at times, panic) to the proceedings. He almost feels too likeable for a film which doesn't particularly want to be liked. Cooke, on the other hand, is the pleasant surprise here. It's not inaccurate to say that I've struggled with her past performances, feeling an emotive disconnect between the actress and the camera. So when Olivia rocks up here as a character with an empathic dissociative disorder, someone incapable of feeling an emotional response to anything, even I can't explain why I suddenly found her to be more relatable than ever*2. Far from being uncomprehending in her responses to people, Amanda reads emotions in others flawlessly, using them to her own advantage with the unclouded logic of someone unencumbered with guilt or even morality. Very much my kind of psychopath*3. The mechanics of Cory Finley's story are effective, even if any twists in the road are signposted well in advance. But the heart of the film is as morally dysfunctional as its protagonists, not quite willing to endorse their behavioural breakdowns, but not flinching away from showing them anyway. And cinematographer Lyle Vincent's lengthy 'sofa shot' in the third act, complete with its crawling zoom, is a work of art in itself. Bravo. Heathers, To Die For, Plastic. To rent/stream, sure. Most people won't get much out of repeat screenings. Then again, you're not most people, right? Let's not go mad, but everyone involved can be pleased with what they've made.